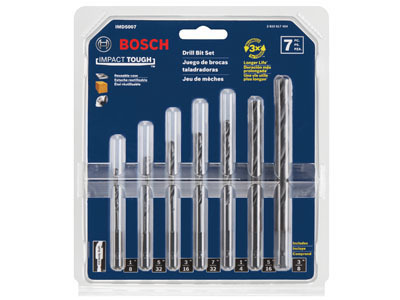 Bosch impact tough drill bits with 1/4 In. hex shank are ground from a single piece of tool steel. The unibody built design gives users 3-times longer life vs. standard 2-piece drill bit and 1/4 In. hex shank designs in impact drivers. 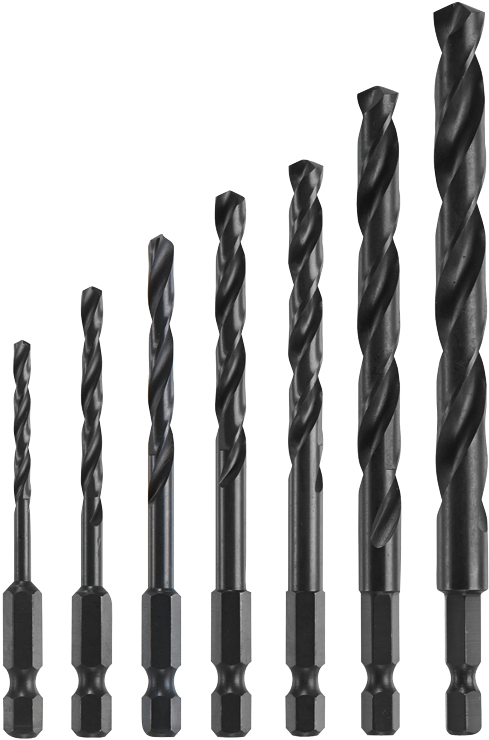 Bosch impact tough drill bits also feature a 135-degree split point tip for less walking and all bits are finished with a black oxide coating to protect against heat buildup. The Bosch IMD5007 7-piece set comes packed in a reusable clamshell that folds in half to easily remove and replace the drill bits. Set includes: 1/8 In., 5/32 In., 3/16 In., 7/32 In., 1/4 In., 5/16 In. and 3/8 In. diameter bits.